A brief history of Kawasaki triples. Slightly biased to the best all rounder of the triples, the KH400. 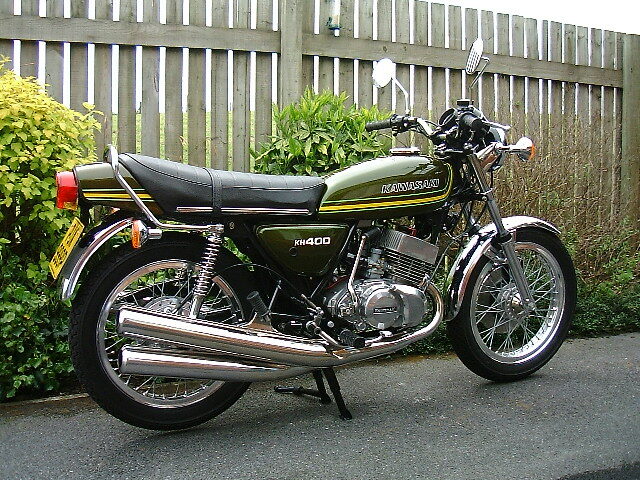 In the late sixties and early seventies Kawasaki stunned the motorcycling world with a series of exciting and powerful two stroke motorcycles. The first models of this era were the Samurai 250/350 twins, closely followed by the legends themselves� the triples. 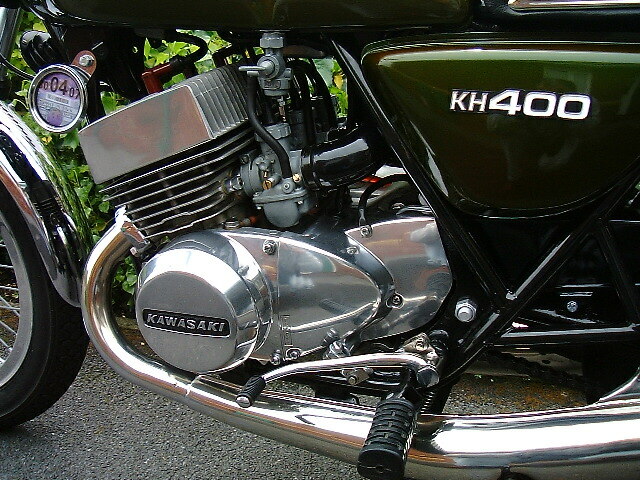 Kawasaki Triples came in a number of engine sizes�250 (S1), 350 (S2), 400 (S3), 500 (H1) and 750 (H2). 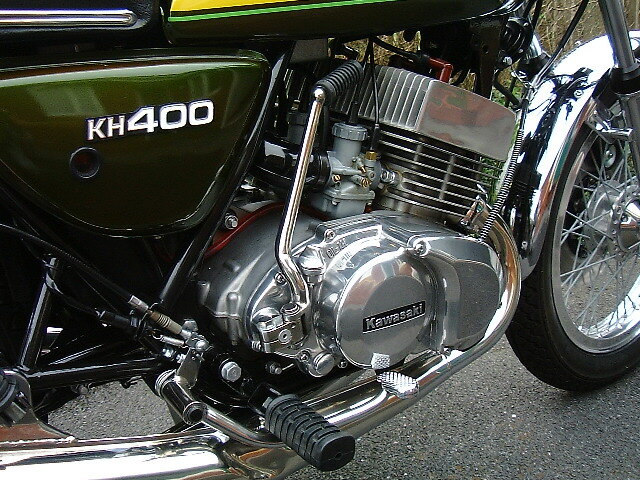 Kawasaki also added the KH range as with the KH400 A3 shown below, these were simply updates of their earlier 250, 400 and 500 machines. If you didn�t have one of these bikes in the seventies as a teenager then you just couldn�t earn the respect that came as part of the package with a triple. Thirty odd years on and the legend is as strong as ever and prices for good examples reflect this, nothing on earth sounds better than the �howl� of a Kawasaki triple at 9000 revs or looks as spectacular as the smoke screen that it lays down behind along with that classic two stroke smell. The 250 was the most popular followed by the 400, the 350 is rare but the 500 and 750 were the original demonic machines, Kawasaki thought it was o.k. at the time to fit powerful engines into flimsy frames with skinny tyres and poor brakes, the 750 soon became known as �The Widow Maker� for obvious reasons, but this did not deter the enthusiast and foolhardy from parting with their cash. 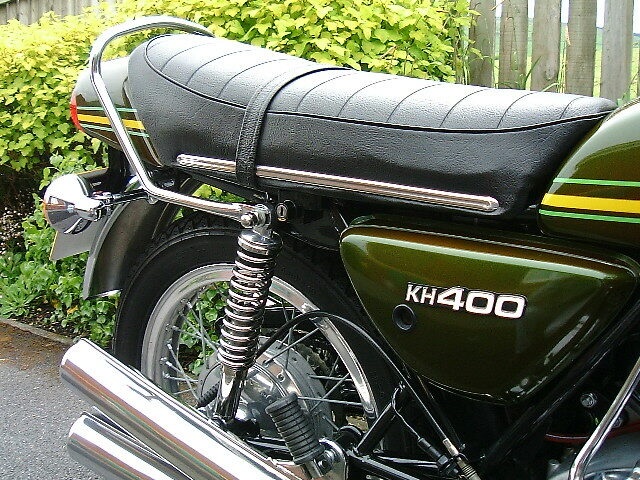 Out of all the different variants of triples one was to become known as the most user friendly and best all round triple� the KH400, it had good looks, a proven engine, handled considerably better than the other triples and came with decent brakes and electronic ignition. Sadly not many original U.K. triples are around these days, many have been imported from the States, in fact there are more imported 750s in the U.K. today than there was U.K. models in the seventies. �Let the good times roll�, as the Kawasaki slogan goes. So here we have my original KH400 A3, every part on this bike is from the seventies and has been rebuilt by sourcing parts from all over the world, everything is correct for this model and works perfectly. 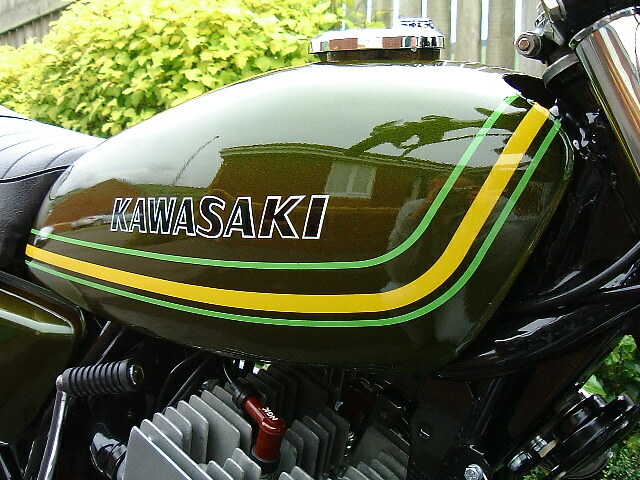 One of the bikes outstanding and a very rare feature is the paint set (tank, side panels and tailpiece) as they are all original, just as they came out of the Kawasaki factory in Japan over thirty years ago, they have not been repainted. 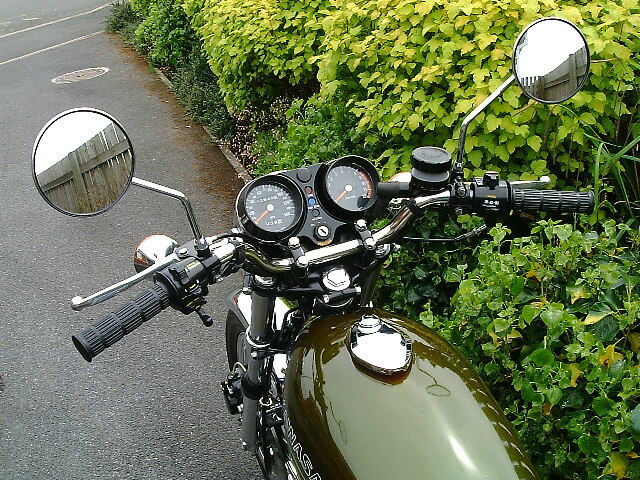 This bike is insured, taxed and mot and gets ridden regularly around South Wales through spring, summer and autumn. Most favourite venue� Porthcawl. 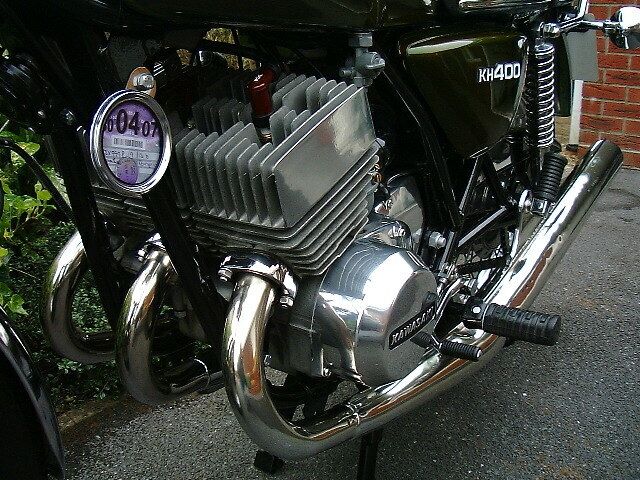 My Show winning KH400 A3. I sold my Honda X11 so I could spend more time riding this classic. More close-up pics of my KH400. This NOS tank came from Norway. NOS engine cases to both sides.. Original dark green, how rare is that? Both side panels from the U.S.
Seat recovered, good original rear mudguard and U.K. sourced shocks. Many NOS items here along with some repainted items. Job satisfaction in repainting rather than buying NOS. 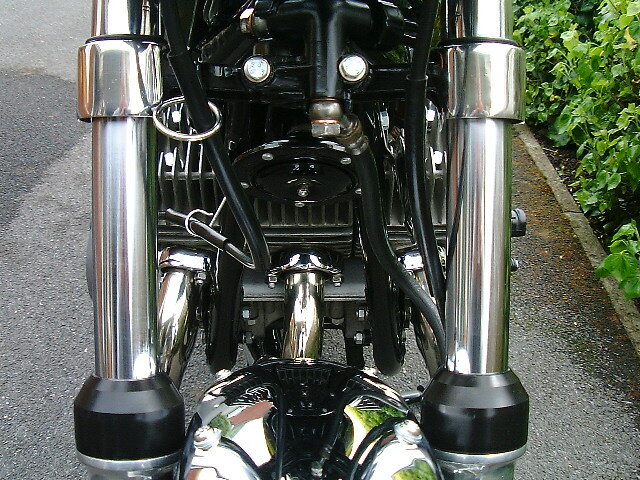 Engine stripped, checked and rebuilt with new rings, bearings and gaskets this year, 2006. Oct. 06. 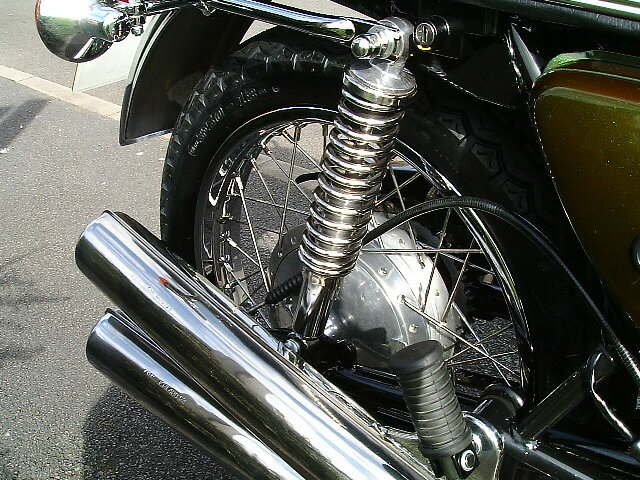 Original front rim re-chromed, wheel rebuilt and new Dunlop K82 tyre. Oct. 06. 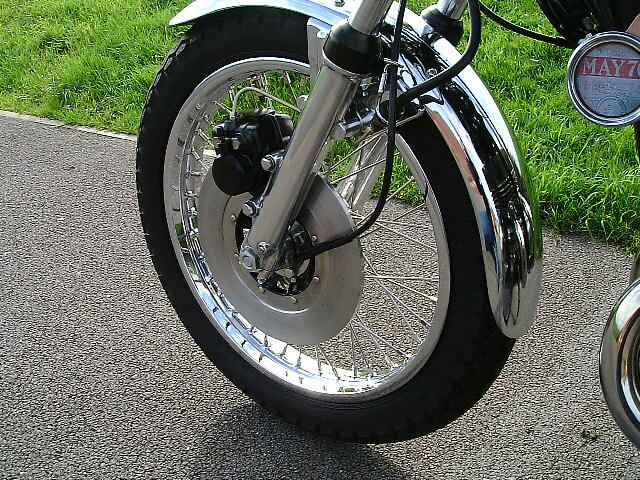 Original matched rear rim re-chromed, wheel rebuilt and new Dunlop K82 tyre. 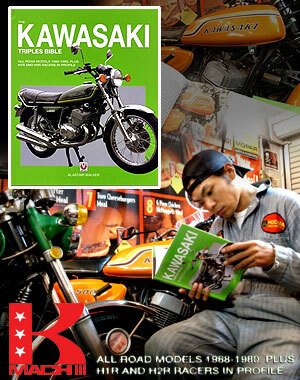 My Kawasaki KH400 A3 is chosen to front the cover on a new world wide publication, The Kawasaki Triples Bible. My KH400 A3 is on the front cover as well as included inside and is seen all over the world by triple enthusiasts. 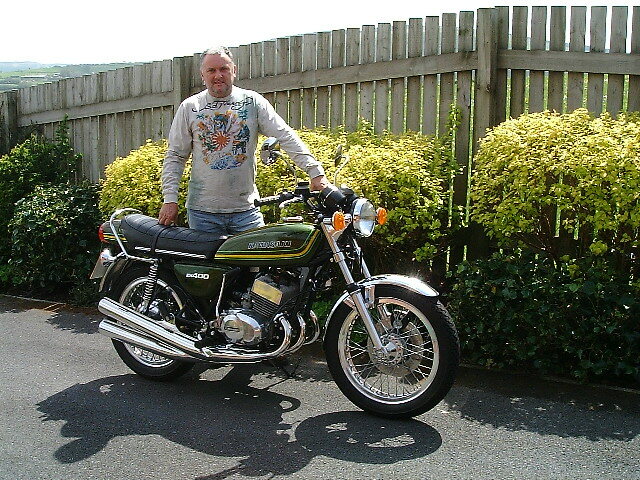 My Kawasaki KH400 A3 was reluctantly sold June 2015. 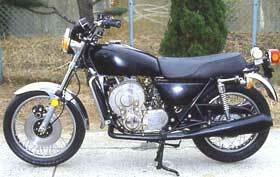 This bike never made it to production, it has Kawasaki's own Wankel rotary engine fitted. 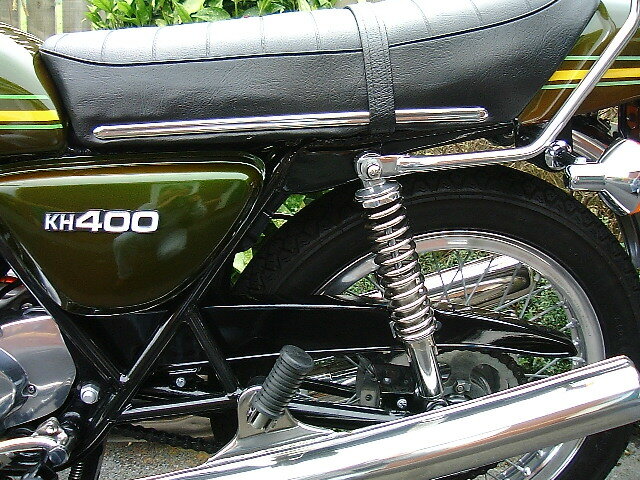 Many Japanese manufactures developed a rotary in the seventies but only Suzuki put one on the road, a decision they soon regretted as it almost bankrupt them. 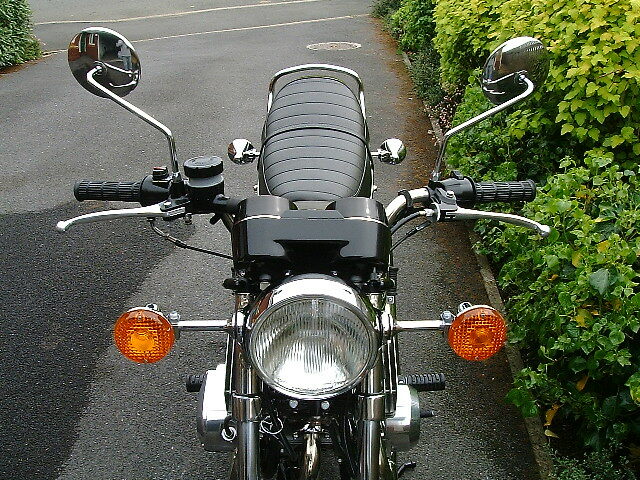 This bike the RE5 is now very collectible, I have restored two.